The injury bug has bitten the Sabres hard. Robyn Regehr and an unnamed forward (assumed to be a center) have joined Ryan Miller, Tyler Ennis, Tyler Myers, Mike Weber, Cody McCormick, Pat Kaleta and Brad Boyes on the injury list. 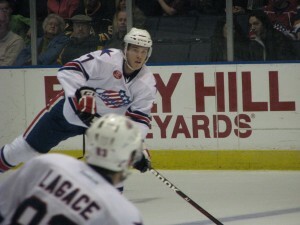 The Sabres have called up Brayden McNabb and Paul Szczechura from Rochester. There is still no news on which forward was injured – Mike Harrington speculates that Thomas Vanek or Jason Pominville could be candidates based on plays from last night. Regardless, the Sabres will be playing with quite a few Rochester Americans on their roster this evening as the struggling Washington Capitals roll into town. The Sabres are in desperate need of a home win and a bounce back victory after three-straight losses. The Capitals are in equally rough water as they have failed to live up to expectation this season despite their high payroll and roster of superstars. Alex Ovechkin, Alex Semin and high-priced free agent Joel Ward have all been sat down for various lengths of time throughout the early going here. 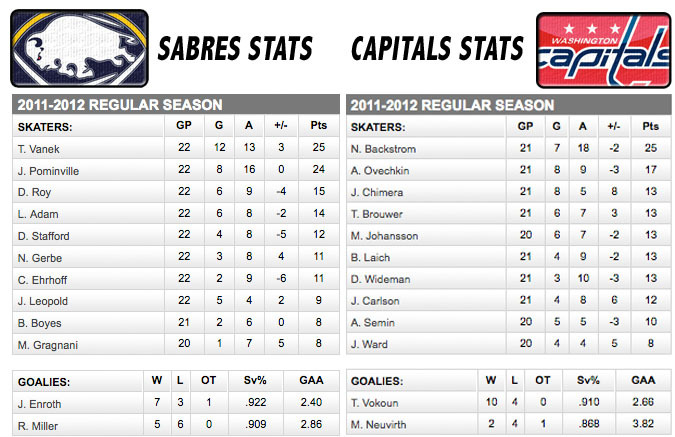 This might just fall into the must-win category for the Sabres. A week and half ago this team was second in the conference, now they’re tied for eighth and are in desperate need of a big run to climb back into the top half of the conference. The Youngsters: McNabb, Kassian, Brennan and Tropp. Sure Szczechura could fall into this boat as well, but he has seen time in the NHL (Tampa Bay) and was signed for veteran depth, he certainly isn’t a prospect. Still, the Sabres need big contributions from this bunch. Brennan has been great in his couple games, Tropp has shown he may be the next Pat Kaleta and Kassian and McNabb will need strong showings this evening to prove they’re at the same level as the other Amerks in the lineup tonight.